Steve Turchan, a Neenah, Wis., psychiatrist, considers himself a lucky man, with a good life, a great family and career, and faith. Any health issues he's experienced, he says, are just ‘bumps in the road of life.’ That said, he's had quite the bump-filled journey. According to a story in the Post-Crescent newspaper, the last 28 years of Turchan’s life have included a litany of medical issues. He was diagnosed with Hodgkin’s disease at the age of 24, followed by eye, bladder and prostate cancer, a heart attack on his birthday in 2009, triple bypass surgery, 11 stents and two bouts of sepsis. Then, this past March, Turchan learned that his heart was failing, and he would need a transplant. 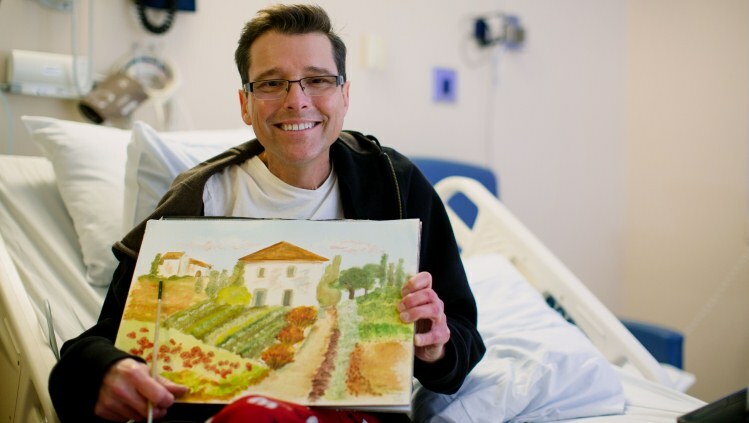 In July, as he packed his bags to begin the transplant waiting game at Mayo Clinic, he came prepared to do something he hadn't done in quite some time., Although Turchan had been taught to paint at the age of four by his mom, he could count on one hand the number of paintings he's done since his health odyssey began. So along with the usual toiletries and whatnot, he also packed painting supplies. Turchan was discharged in mid-December, but remains in Rochester for 90 days of rehab, weekly lab work and heart biopsies, and, we assume, more painting. You can check out a slide show of his paintings below. While you’re here, paint us a picture by sharing your comments, and maybe share this story with others via our handy social media tools. Click on the play button to begin the slide show. Click again to see larger images. Amazing story and artwork! Thank you for sharing!